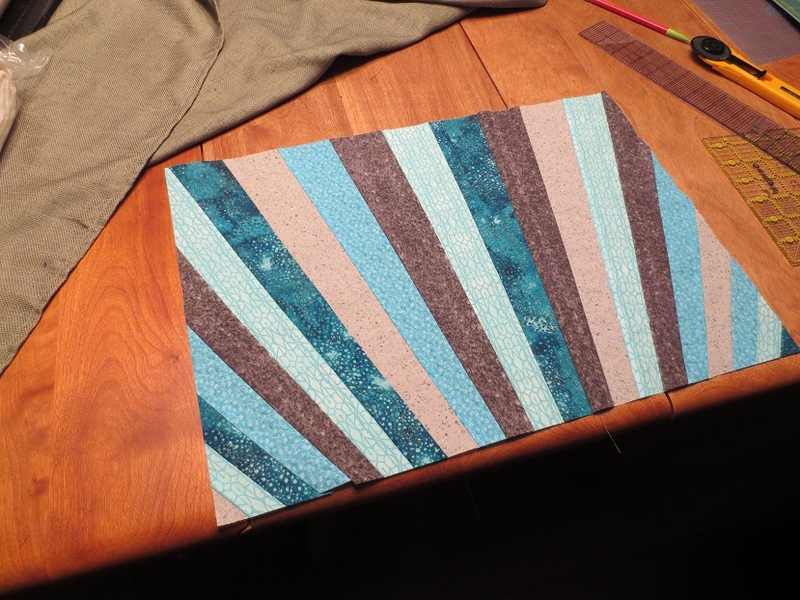 In preparation for making a T-shirt quilt or two, I wanted to practice my quilting skills, particularly binding and quilting the layers together. I thought a great way to practice these would be to make a set of quilted placemats! There will end up being a green, yellow/orange, and red one as well. I think I’m going to finish this one out though before starting piecing the others, just to try everything out. I STILL haven’t finished the Donkey Kong stitch. I know, I know… I’ve been putting it off. But I have been working instead on a secret project. I’m stitching one of the patterns for a themed cross stitch book that will be coming out in March, and my stitch will be one of the demo photos! I’m actually really excited about this. I’ve always wondered who stitches the samples in those books, now I’ll be one of them! I’ll elaborate more on the book once it’s de-classified 🙂 Update: see post Year Recap! In other news, I got my tonsils out a week ago today. It was actually not as bad as I was bracing myself for. Particularly the surgery itself; I am really antsy/panicky when it comes to needles and anesthesia. I used to even get laughing gas at the dentist because I would stress out so much. I went into this one very mentally prepared, and it was no big deal at all. Zen is the way to go. The hardest part of the recovery was trying to sleep. I propped a bunch of pillows up on my bed so I could sleep sitting up, because it felt really uncomfortable to lie down and I would tend to snore just breathing normally at first. Falling asleep wasn’t the problem — I made myself wake up every 4 hours to take more medicine and drink water because my throat would get too painfully dry if I didn’t. This means for a week straight, I never slept more than 4 hours, and typically I didn’t go back to sleep after taking more medicine until I got drowsy later. If you ever get this done, especially as an adult, they tell you to drink water like crazy, and it’s SO WORTH IT. Even though it hurts to swallow, do it, especially in the zone of the medicine when it doesn’t hurt too bad. I had to pee about every hour, but the throat pain never got unbearable. Second hardest part was not being able to talk. My voice was so hoarse/just the vibration of speaking hurt so much that I just preferred not to do it. It makes it inconvenient to not be able to use a phone or speak to people, particularly when in public. Yesterday evening though, I started to feel the scabs sloughing off, which just felt like swallowing little bits of food when I drank. Sorry to be gross, but I feel like documenting it for the sake of anyone who has this done in the future. This I knew was a good sign — almost better! I could even talk for a couple of hours, and I could tell my throat wasn’t as tight as it had been feeling. I went to bed late as usual, after my 2 am dose, and set my alarm for 6, but when it went off I thought you know what, I don’t think I need it. Either at that point or later on, I realized I could sleep lying down now, so I chunked the extra pillows. And slept until 2 pm. Needless to say my throat was super dry when I woke up after 12 hours, but I feel 100 times better than I have for the past week. Other than a dull, sore throat pain, I feel back to normal. My best friends during this process: Mark (my husband), chicken Ramen, and a bag of frozen peas. Best flexible ice pack ever (for the front of my throat). I used that every day I think. I even kept the noodles in my Ramen today. I think I may be on some squishy solid food tomorrow, which is really exciting. I’ve been craving some Shipley’s donuts. Author erinkPosted on July 27, 2012 November 18, 2016 Categories Crafts, LifeTags quilting, surgeryLeave a comment on Placemats! and Surgery!